Following several lawsuits claiming that Apple’s iPhone batteries were designed to slow down over time, the company’s consumer perception has taken a hit in Singapore, YouGov BrandIndex data shows. While the tech giant has since apologised for the slow-down, the drop has seen its scores fall in a number of areas. 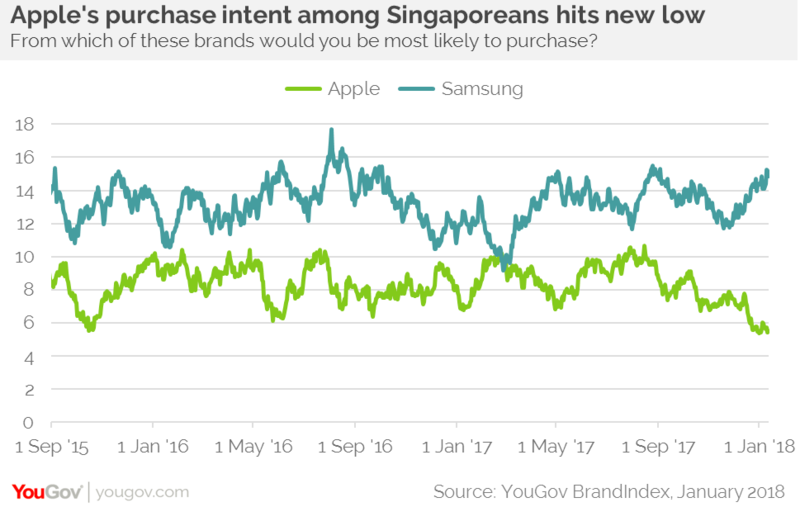 Apple’s Buzz score – that measures whether someone has heard anything good or bad about a brand during the previous two weeks – has fallen to lowest level since we started tracking the brand in Singapore at the start of 2015. Its Value score (showing whether people think a brand represents good or poor value for money) has declined in a similar way. In addition to these falls, we have also measured a drop-off in consumers’ purchase intent. In recent weeks, Apple’s Purchase Intent score has reached the lowest level we have ever monitored for the brand, falling to +5.4 (down from +9.5 six months ago). As it stands, Apple is behind Samsung across a range of metrics. In addition to Buzz and Value, it also trails its rival when it comes to perceptions of quality, whether someone would recommend the brand to a friend or colleague, and also overall impression. However, Samsung itself shows that brands can recover from setbacks in perception. Following reports that its Galaxy Note 7 batteries exploded and caused fires, it saw several measures fall-off notably. Yet it has since recovered and Samsung’s Index score – which measures overall brand health – is now back to the levels it was at before its problems with the Galaxy Note 7. 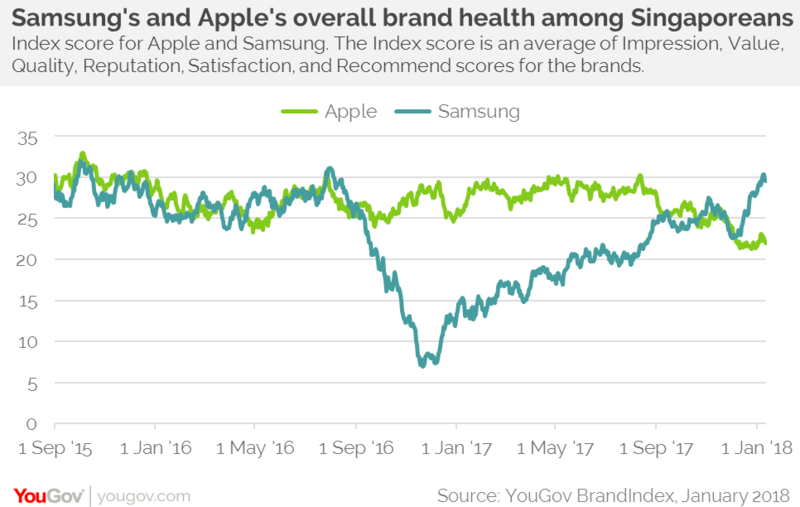 While Apple’s overall brand health has fallen behind that of Samsung’s in recent weeks, it has not reached anything like the low levels seen following the reports of the exploding batteries.